Organize your closet in under 30 minutes! It doesn’t matter how many color-coordinated hangers or scarf organizers you buy - there will come a day when you look at your closet and wonder, how the heck did it get so messy?! The daily barrage of pulling stuff out and putting it back in (and maybe, sometimes, only halfway hanging onto that color-coordinated hanger), or buying new stuff without taking out the old, or jamming in all sorts of items beyond clothing can turn this functional space into one that’s a hassle to use. Doing it this way gives you a chance to think about what you’ve worn and liked that season (or what you’ve ignored completely) and do some editing before the next season starts. So if your closet needs a reset, set the timer and get going: you’ve got 30 minutes to get it working for you again. Before you open the closet doors, find a few trash bags or bins to help you sort. The two basic piles you're going to make are for clothes to throw out and clothes to donate. We suggest two more categories: clothes to give away (like maternity clothes to a pregnant friend) and clothes to sell (a pristine bridesmaid dress you’ll never wear again). Don’t buy anything! You may think you need more hangers or bins to get your closet organized, but save making those purchases for after you complete the organization process or you might buy things you don’t need and that just turn into clutter. In addition to prepping for your piles, bring along cleaning supplies like damp rags, multipurpose cleaner, and a broom/dustpan or vacuum cleaner. If you think you’ll need help making decisions enlist a friend — often having an objective person there can make it easier to decide what to keep and what to toss. The bed is the logical place to gather clothes as you pull them out of your closet: dump everything on there! Hopefully, your garments are already loosely organized—all the shirts or dresses together, for example—so you can pile them onto the bed by type. Pull out any organizers and bins as well, to give yourself a totally empty closet. Now that your closet is completely empty, wipe down the shelves, closet rod, walls and baseboards with your rag and cleaner, then clear the floor of debris with a vacuum or broom. The space shouldn’t be too dirty, so it won’t take a lot of effort to get yourself a fresh palette here. Before you think about putting anything inside of your now spotless closet, take a step back and look at the space to think about the ways it has and hasn't been working for you. The prime real estate is right in front, so think about your most-used items, what you’re always struggling to reach, or which things would be better folded than hung. If your current closet system is in good order but has just gotten out of whack, that’s great—otherwise, tweak it! This step can certainly take longer than 15 minutes but can go quickly if you’re decisive and make a habit of doing it every few months. One by one, take every garment out of the pile and decide if it goes back into the closet. You don’t have to go full Marie Kondo, but as you decide, ask yourself four questions to figure out if you should keep something: Does it fit? Have I worn it in the last 12 months? Will I repair it (for items that are damaged or need alteration)? Do I feel confident in it? If you answer “no” to any of these, put it into one of your piles instead of back into the closet. Once you’ve made your decision, put the garment back into the closet in roughly the right spot and move on to the next item. Work by type (pants, skirts, blouses, jackets) and try to move quickly rather than getting caught up thinking about the clothes you used to fit into or wear for an old job or lifestyle. The goal is to make your closet work for who you are today. It’s helpful to focus on what you’re keeping instead of what you’re getting rid of. Once your closet is filled back up with only the keepers, take a few minutes to straighten everything out and make sure it’s all organized by garment type and by color (even if you’ve been sort of doing it as you put it away). Take your bags out and get them on their way. Put your donation clothes right into the car so you don't just leave them sitting around and get any other items (like the give or sell piles) ready for the next step. And who knows? Maybe your next closet organizing experience will only take 15 minutes! 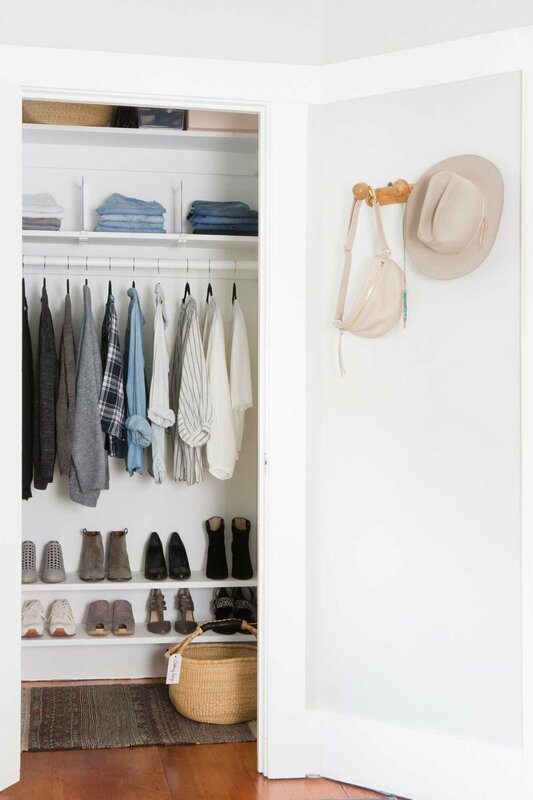 If your organized closet is further away than you have time for, give HIVE a call - we’d love to help you reimagine your closet, pantry, cabinets, etc!